John Nichol is a teacher at Mooroolbark College who contacted us to organise a private Schoolies Adventure for the Year 12’s at this school. Here, he explains why. Finishing 13 years of school is a fantastic moment in a young person’s life and should be celebrated. At Mooroolbark College we believe the schoolies experience has great potential to be more than a week long party and can instead be an experience that develops and grows a young person and provides a rights of passage into adulthood. At the College we aim to provide an educational experience that moulds our students into quality young people who can go out and have a positive impact on the world. 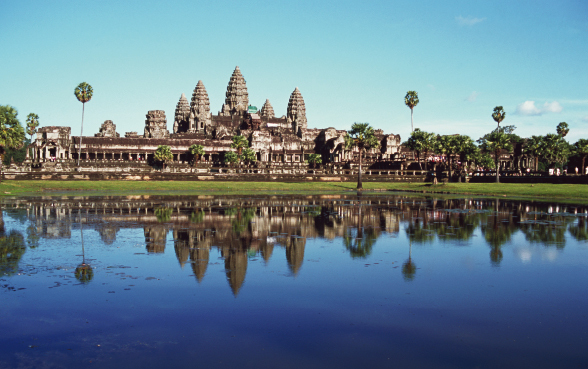 The “Schoolies in Cambodia” trip aims to build on that personal growth and take it a significant step further. give them a stronger sense that they can impact and change the world in a positive way. It will be a life changing experience, an experience of far more value and enjoyment than the traditional schoolies holiday. We have put together the “Schoolies in Cambodia” trip in partnership with World Youth Adventures who have over thirty years experience planning trips exclusively for students and school groups. They have developed a terrific itinerary for us (including a full risk assessment of all activities) to ensure a memorable and safe experience at a competitive cost. Cambodia is a small country with ancient monuments, many natural attractions, safe and easy travelling and warm and friendly people. This trip offers 15 days seeing world famous monuments like Angkor Wat as well as some Indiana Jones styles temples overgrown with jungle, exploring village life including lake villages built on 7 metre high stilts, working in an orphanage for 3 days (as well as fundraising some $2000 for the orphanage before leaving) and some time to unwind on a tropical beach. We will also visit the very sad and moving museums in the capital Phnom Penh dedicated to the Killing Fields genocide of the 1970s. Travelling with the group and looking after the students will be a Mooroolbark College staff member to ensure that personal growth opportunities are maximized and to assist students to debrief about their experience. World Youth Adventures will also provide a tour guide to ensure that the party is being well looked after, participants are adhering to expected behaviours and that all arrangements are running smoothly. In my 20 years of teaching this is the most exciting and worthwhile experience that I have been involved with and we feel it will have long term positive benefits for those involved. It will be a life changing experience. View World Youth Adventures’ Alternative Schoolies Adventures. you are ground breakers at this.I wish such things did exist for us nineties lot though.our time and I am from Adelaide consisted of gold coast,specially designated school leavers only cruises on either the fair princess,fairstar and later on pacific sky around the south pacific or doing it locally down the southern coast somewhere.my old high school has only just brought in a cambodia alternative in recent years for the new age lot which i commend them for and would love it if the parents can justify the costs for their kids to do such a thing.that’s one place alongside thailand i can imagine myself doing for a group tour open aged in years to come.